This morning, I drove down to the University of Windsor to the Windsor Review office to pick up copies of the newest edition of the magazine. It features the incredible work of Sandi Wheaton, a photographer from Windsor. I was meeting her at this neat little cafe at the corner of Erie and Lincoln. Sausage and eggs and mugs of tea and coffee. 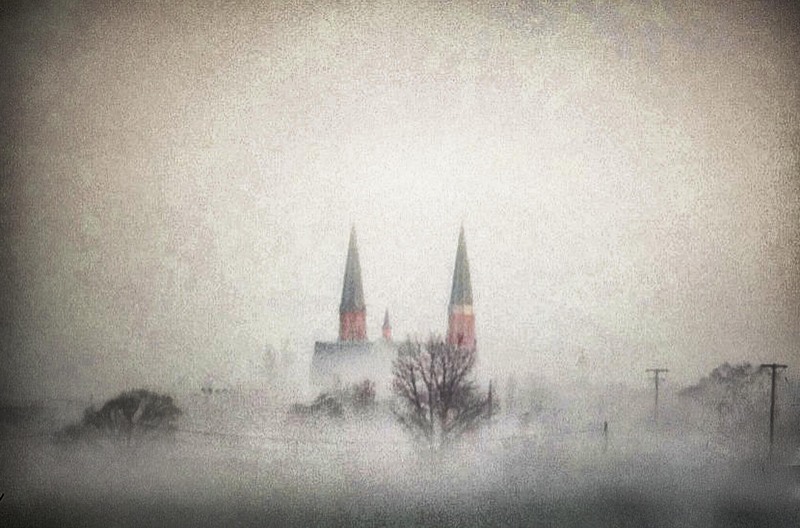 But en route, I drove down to Riverside Drive and pulled over to make this photograph of the church’s steeples poking out through the fog along the river. It was like out of a painting from one of those medieval villages in France. MAIN STREET CONTINUED — WYANDOTTE CORRIDOR, WINDSOR ONTARIO. I have begun an exploration of my own town. I went downtown Sunday morning, and walked around to see what I used to see every day when I worked at The Windsor Star. I spent more than two decades down there, and rushed around. Sunday I took my time. This is what I found. Jon Paul Fiorentino is a Canadian poet, novelist and short story writer, who was born in Winnipeg, Manitoba. He currently teaches at Concordia University in Montreal, and is editor-in-chief of Matrix Magazine. He did a reading at the University of Windsor, and charmed a crowd of students, and sold copies of his books. He was funny, engaging, challenging, and connected to the students who had been studying his work. I just returned from Barrie, Ontario where I served as publisher in residence at Georgian College. I met with many talented writers. Some shared stories about working as social workers. Some wrote about wrestling. Others wrote historical accounts. One person told me a story about their mother who made life miserable for her. While I was there, I spoke to a class of Bruce Meyer’s then sat back and listened with delight to his tales about the Romantic poets, especially Keats. Amazing discoveries in the space of an hour. Bruce brings to life that era for his students. I sat entirely wrapped up in his stories. While I was there, I reacquainted myself with Fran’s, a restaurant that I used to go to in Toronto. My early career as a writer centred around this place at St. Clair. Coffee and a piece of apple pie. And writing poetry. It was there, too, that I read all of Dylan Thomas. 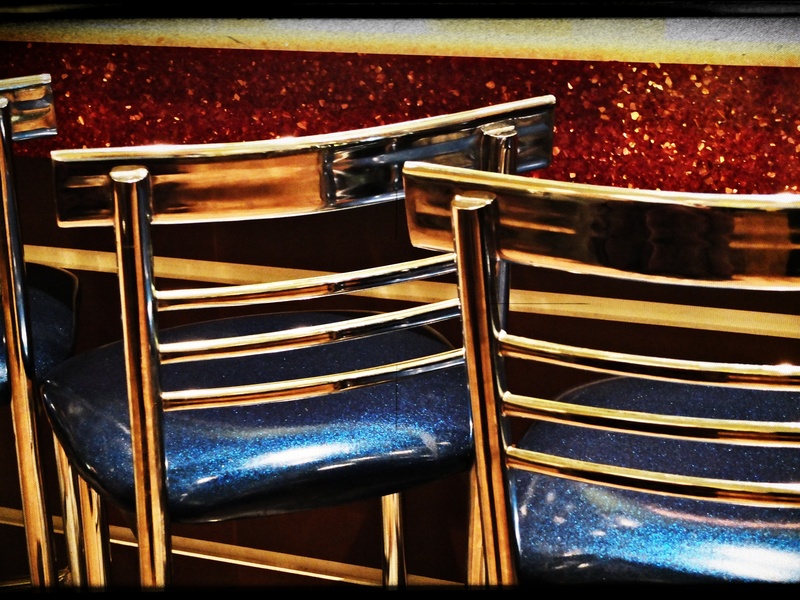 In Barrie, I photographed the chairs at Fran’s. 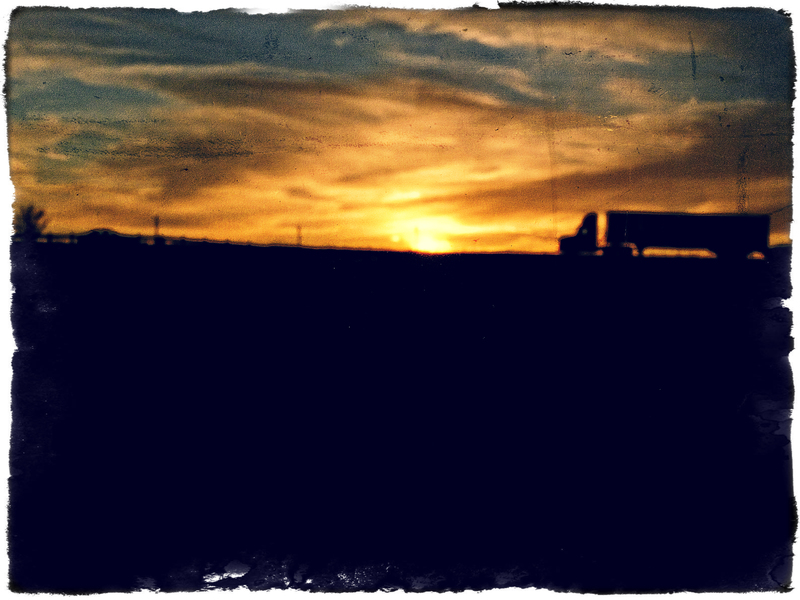 On the way back to Windsor, I drove into the sunset. This is what I captured.